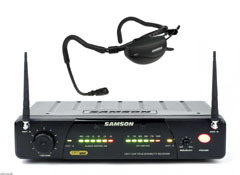 With its built in noise gate the Samson Airline 77 microphone rivals the accuracy and noise cancellation capabilities of any microphone on the market when used with Dragon NaturallySpeaking, Dragon Medical or other speech recognition applications. IMPORTANT NOTE:Some of our microphones include a built-in USB soundcard. Those that do not, typically include the recommendation to add a proper USB soundcard. This is because the integrated OEM soundcard (that came in your computer) may limit the accuracy of your new professional microphone, or even prevent it from working altogether. See our Microphone Comparison Chart for more details regarding microphone performance. The AirLine 77 Headset System offers a true wireless experience with no beltpacks and no cables, allowing complete freedom of mobility. The system includes the AH1 headset transmitter, along with the CR77 receiver. 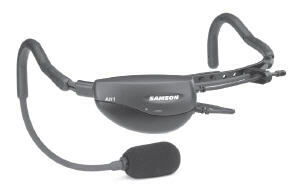 The AirLine headset transmitters feature the Samson Qe Fitness and QV10e Vocal microphone elements. 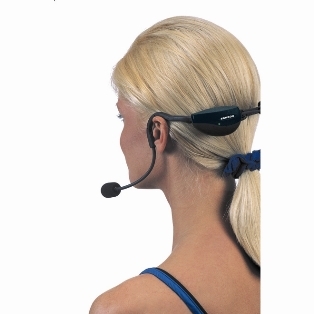 The Qe and QV10e headsets were designed to go around the back of your head rather than over the top. This allows the transmitter to be attached directly to the headband, out of the way and completely unobtrusive, while being comfortable and secure during performances or group fitness classes. Both the Qe and the QV10e are designed with unidirectional microphones and cardioid pickup patterns that reject feedback. The Qe Fitness headset is ideal for group fitness instructors who need a durable headset that will remain in place despite repetitious movement. The QV10e Vocal headset has a microphone element that's perfect for singers who need hands free performance. Bothtransmitters offer 14 hours of operation on a single AAA battery. The core of the receiver system is the CR77 true-diversity half-rack UHF receiver. It's deisgned to work flawlessly with AirLine UHF transmitters. Featuring dual tuned, molded antennea,a front panel display with large multi-segment audio level and RF level LED meters, and a large rotary volume knob that allows easy adjustment of audio output, the CR77 takes all of the guesswork out making your wireless system perform.Its synthesized PLL frequency control circuitry keeps the signal locked and true while the LED metersmonitor the system's operation.The rear panel features balanced XLR and unbalanced 1/4-inch outputs allowing flexible connection options. In addition, two CR77 receivers can be rackmounted together in a single space rack adapter available as an added accessory. With AirLine 77 Headset System, you get complete wireless freedom that's good to go anywhere the music takes you. With purchase of the Airline 77 microphone, you'll receive a FREE 8" x 9" thickly padded KnowBrainerNeoprene Zippered headset microphone bag! Introducing the most accurate & most noise canceling microphone we have ever tested! The Airline77 is Samson’s newest version of the Airline series featuring the first micro-technology transmitters in the industry. 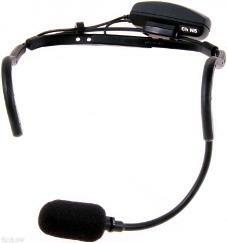 Unlike conventional UHF wireless microphones, the Airline 77 requires no belt-pack or cables. The AH1 headset transmitter mounts right on to Samson's comfortable and lightweight headset. Incredibly small, the AH1 still features an easy-to-reach power on/off switch; an input sensitivity control to adjust the mic level; a mute (audio on/off) switch and a multi-function LED that indicates when the transmitter is on and when your battery's running low. The AirLine 77 Series' CR77 wireless receiver gives you the dropout-free reassurance of a true diversity system. The CR77 constantly polls its two receivers and locks onto the strongest signal. The CR77 is rugged, durable, and crystal clear, with an impressive range. It brings you sophisticated wireless technology at a great price. One of the biggest problems end-users have with NaturallySpeaking is maintaining a steady volume level. When you run the Audio Setup Wizard you preset your volume input level but unfortunately most people read at a lower volume then when dictating in real-world stop and go free-form dictation. End-users also have a tendency to raise their voice when they become frustrated. The Airline 77’s built-in compressor gate goes a long way in leveling out these types of problems. No other microphone, I know of, includes this capability and that's why I made the Samson AirLine 88 my personal microphone of choice; just after the Airline 77. If you're a physician working on a patient note or an attorney working on a brief, time is not your friend. If you require the highest possible accuracy/efficiency, serious noise cancellation and/or longer battery life, the Samson Airline 88/77 is the only way to go. I use the Samson Airline 77 because every second I have to spend correcting my dictation is time I have to take away from another project. Note: The Hybrid Samson Airline 77 is not the same unit that our competitors are selling. Although this unit will work equally well for music applications, it additionally includes specialized speech recognition modifications. Our competitors' Airline 77 units, unless otherwise specified, will not work for speech recognition. "This Samson Airline 77 kit is the best solution out there. Period." 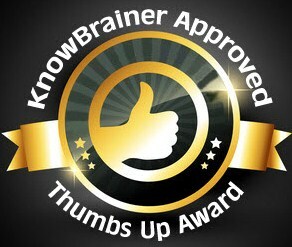 Description: My rating and review of Samson Airline 77 kit sold by KnowBrainer. Review Description: My airline 77 arrived in three days – pretty amazing when you consider the distance it had to travel. It is delightfully accurate – more even than I might have imagined even from my Sennheiser MD 431 which I sold because it was to slightly too cumbersome. Most importantly: your service is stunning. I have experienced this before from you. I never fail to appreciate it.